Madde is the anchester for our breeding, and therefore very special to us. 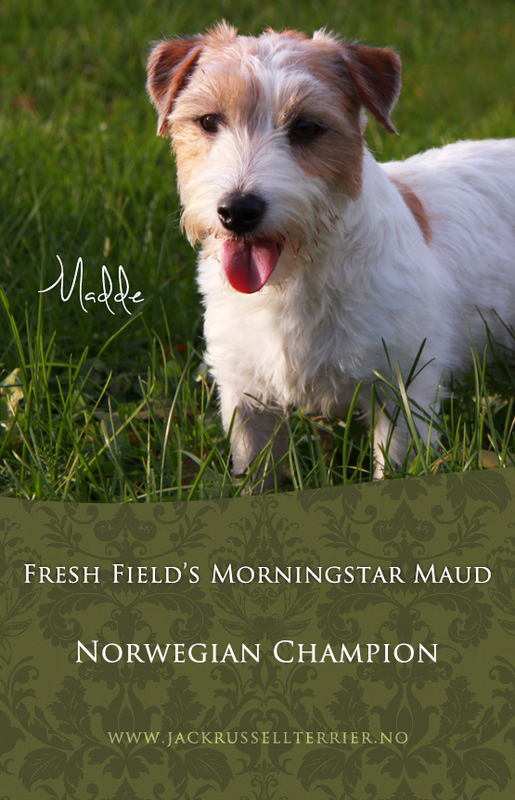 Madde was imported from Fresh Field kennel in the Ne therlands, to Sweden by Kennel Saltisgården and we imported her later to Norway. Madde has the sweetest personality and is a very friendly and calm dog, and is right now living a nice retirement life together with her family in Oslo. Arctic Maple''s Canadian Litter - This was our first litter, and we were therefore very excited that we could mate her to Multichampion Kanix Fast Track from Denmark. From this litter we kept Arctic Maple's O'Canada and Arctic Maple's Crazy Canuck in our breeding. Both of them became champions. Arctic Maple's Aviation Litter - For this litter we were able to use a dog that completed Madde very much; Multichampion Carisbrook Chester from Australia. Chester is a lighter type, and this he brought on to his children. We kept Arctic Maple's Cirrus Vision and Arctic Maple's Avro Arrow in our breeding. Arctic Maple's Cupcake Litter - For this litter we wanted to try out a totally different kind of line - huntingline, and we used Multichampion Vitsuddens Tjatte from Sweden. One of the puppies from this litter, Arctic Maple's Vanilla Cream attended the Norwegian TV show "Cæsar Hotel" - and by that became a movie star!